The seven part serial Sky, made in 1975, has remained vivid in my memory with its disturbing imagery in combination with Eric Wetherell's atonal incidental music, mainly cello and harpsichord by the sounds of it, and lashings of Radiophonic-like electronic noises. Certainly, the appearance of the lead character Sky, as played by Marc Harrison, was distinct and unforgettable. Tall, androgynous, blonde, sometimes semi-naked (what was it with semi-naked boys in children's telefantasy of the 1970s?) 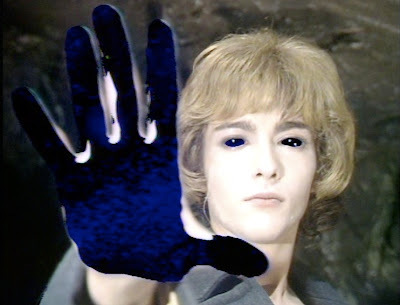 and sporting an alarming set of blue eyes, Harrison encourages comparison with many of the sexually ambiguous pop stars of the day, particularly Bowie, and the story positions the character of Sky as some teenage version of The Man Who Fell To Earth, whilst mining the themes of the fallen angel guarding the future of the Earth. What's so striking about Sky is, whilst it is a tale of an alien 'stranger in a strange land', it's firmly set in a realistic, contemporary for the time, rural landscape. Whilst Doctor Who was traipsing about the Nerva Beacon up to his neck in Cybermen, Sky was quietly undoing much of the rather simplistic tropes of children's telefantasy. You won't find the 'so hip and trendy that it hurts' fashions, riotous title sequences and outlandish plots of The Tomorrow People and their ilk here. HTV quietly carved out a reputation for itself in children's telly and their Children Of The Stones and Arthur Of The Britons had a similar grittiness to them. 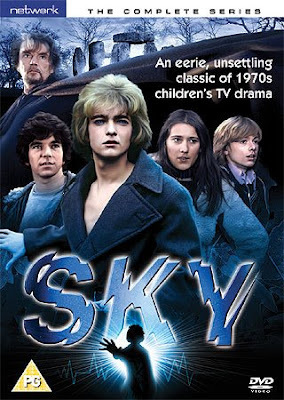 Sky is set in the shadows, is often quite dour, surreal and the teenage characters who discover Sky are rebellious, in the main identified either as 'working class' in the case of Arby and Jane or as a 'respectable rebel' like their friend Roy. The central performance by Marc Harrison is impressive, attention grabbing and otherworldly, aided by a simple but effective lighting design that ensures he is constantly aglow in all of his scenes and a crude but interesting use of CSO to fill his blue contact lenses with psychedelic visuals and imprint his outstretched hands with restless energy. It is a clever counterpoint between what we perceive as the sci-fi inspired psychedelia of the 1970s and the actual reality of the 1970s as lived within the class divisions between Arby and his father and those of the Major and his son Roy as firmly described in the opening half of the serial. These divisions between the humans, in the terms of 'who owns the land' and 'who works the land' which echo the prevalent ecological theme, are also carried through into the relationship between Sky, a cold, unforgiving child God, and his human recruits Arby and Jane, who he considers as stupid and primitive. Sky is simply using the two teenagers to help him get back to his rightful place in space and time where the descendants of mankind have turned to a way of life that is anti-technology and pro-nature. 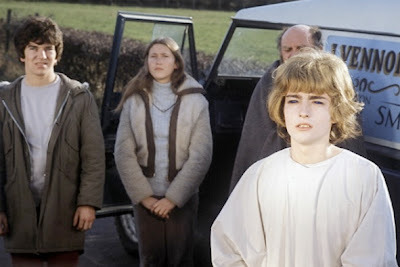 It's a strange series, with a stilted pace that even back in 1975 must have set it apart from regular flavour children's drama, teetering almost into the unbearable one minute and then completely absorbing the next. Harrison's captivating performance aside, we have Stuart Lock as Arby and Cherrald Butterfield as Jane, ensuring that West Country accents made their presence felt on the ITV network beyond the regional news. Of the two Lock is the strongest, a natural performer who competently brings Arby's cheeky fecklessness to life, whilst Butterfield struggles with a horribly underwritten role and is rather wooden in the process. Their motorbike riding posh friend Roy is played by Richard Speight, familiar to all cult telly fans as the wet time traveller Peter from the early stories of The Tomorrow People. And then we have Robert Eddison as Sky's nemesis Goodchild, a sort of neo-paganist manifestation of The Green Man hurling all sorts of environmental terror to send Sky back to his own time and staunch man's progress. It's a big performance, often overblown, but still a fitting contrast to Harrison's subtler acting. And he does a marvellous line in spouting gobbledegook and poncing about in a swirling black cloak. Along the way, we've also got British archive telly stalwarts Jack Watson, David Jackson, Bernard Archard and Peter Copley providing interesting background cameos. The fourth episode, What Dread Hand, also provides us with a superb characterisation from Meredith Edwards as Tom, a patient in the hospital that Sky eventually gets carted off to. He's brilliant in the way he reverses the mentally ill stereotyping and comes across as someone actually possessing an open enough mind to successfully communicate with and understand Sky's intentions. It can't make its mind up what it wants to be, producing a serial that wanders off into surreal camp (Sky's futuristic costume in the final two episodes, Robert Eddison doing just about anything) and yet featuring some startlingly eerie moments such as the constant attacks on Sky by the forces of nature, entangling him in branches and roots. 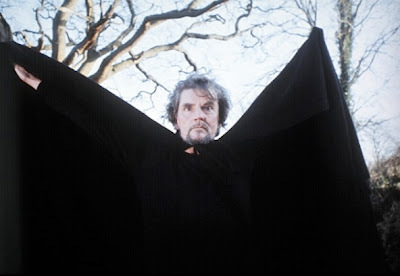 There's a very strange confrontation in Life Force, episode six, where Goodchild traps Arby and Jane in a deserted house by turning a crow into a sinister man sized, clawed creature. 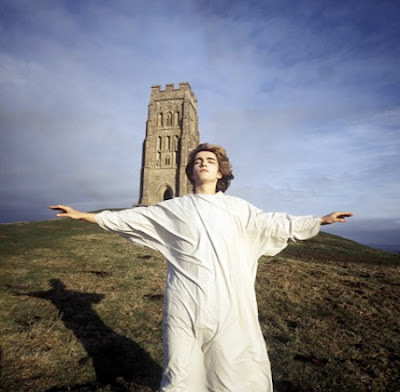 Beneath the odd pacing, the flipping back and forth between kitsch and scariness, there is something genuinely fascinating going on and the themes that Who stalwarts Bob Baker and Dave Martin tease out of the ambiguous narrative chime with that 1970s feverish fascination for ancient astronauts and the mystical power of ley lines and stone circles (the final episode is shot on location at Stonehenge and see the later Children Of The Stones and 1979's Quatermass for a further exploration of this) and eventually widen to encompass a warning about man's dependence on machines, his disregard for the planet and the environment whilst also plugging into Arthurian legend (there's a sequence shot at Glastonbury Tor), The Golden Bough and even A Canticle For Leibowitz. The directors Patrick Dromgoole, Leonard White, Terry Harding and Derek Clark all manage this with a great deal of consistency, seizing the opportunity to use as many techniques as they can to develop the often thick atmosphere that surrounds the story. There is a tendency for ambiguity, both visual and narrative, to obfuscate and its lack of clarity and deliberate obscurity can be frustrating. 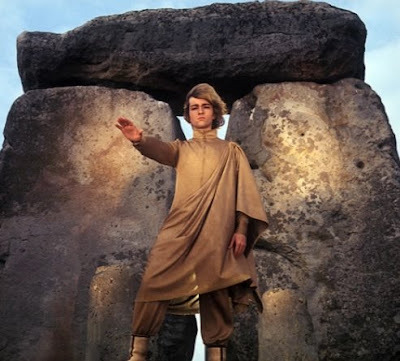 There's even a rather ham-fisted attempt to critique the fag-end of hippiedom in Life Force, where a young couple, a man and a woman, are attacked in their caravan by branches and roots after one of them has taken Sky in, believing him to be some divine figure. The bizarre attack so unnerves the woman that she appears to renounce her partner's 'hippy' beliefs in one fell swoop. The final episode, Chariot Of Fire, is so downbeat, portraying as it does a post-apocalyptic future where telepathic humans carry out religious rituals based on launch procedures for space rockets, and it ends with Arby, having followed Sky into this future, returned to the present with his memories intact and foreknowledge of what will happen to society as well as potentially some sort of power to affect change. In the end, he simply carries on as if nothing happened. The message seems to be that progress is all very well and good but does it have to harm the planet? Are Baker and Martin not only suggesting that 1960s idealism never solved anything but also that when offered the opportunity to take a different path, mankind simply can't be bothered? I think they are. The Network DVD release contains all seven episodes, although episodes three and seven no longer exist in the archive in any format and the versions included on this set are taken from an off-air VHS supplied by the lovely fellas at Kaleidoscope.